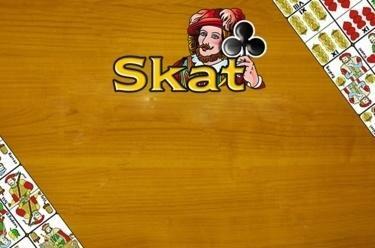 Play Skat online for free now! Did you know that the card game Skat is so popular that it belongs to Germany’s inventory of intangible cultural heritage? Therefore, it should come as no surprise that Skat is the favourite pastime of many GameTwist players. Here you can find detailed information about Skat online and get to know the rules of Skat so that you can prepare perfectly for one of our most popular online games! Skat is a game for true strategists! This card game for three players evolved from the game Sheepshead in the “Skat-city” of Altenburg in 1820. It was composer Richard Strauss’ favourite game, and it is widespread in Germany where the best Skat players to this day compete in countless tournaments. The name stems from the word ‘scartare’, which means ‘to discard’. Skat refers to the card pile that the single player takes before discarding other cards. To win at Skat, you need to take more than 60 points in tricks or (in Null games) take no tricks at all. The game is always played with a single player against two opponents. Bidding is used to find the player to take on the role of soloist. You must ensure that you do not overbid. The player with the highest bid is the soloist and declares his/her game. At first glance, Skat appears very complicated, but it is the complexity that makes the game exciting. Online Skat on GameTwist – playing at the highest level! Skat isn’t just another game on GameTwist – this card classic is very popular with our players and comes with a couple of special features. In Skat online you can choose between two decks: French and German. Subsequently, you can determine who’s allowed at your table (any player or just friends) and what your stake in Skat is. Moreover, you can decide which rules apply: tournament or pub rules. Whether you play Skat online in a tournament or as part of a relaxed training session, the most important rule is: practice makes perfect! Here are a few tricks to make your fellow players sweat, no matter whether you are a Skat novice or an old hand! Tip 1: Always count points and trumps during a game! Keep a close eye on your progress in the game, because this is the only way to adapt your tactics and play more effectively in Skat online! Tip 2: The correct game opening is essential with Skat! Most mistakes are made when playing the first card. Find out online what the smartest moves are and become familiar with famous Skat sayings such as “Short to the friend, long to the foe”, which determines what to do when playing a card. Tip 3: Practice makes a perfect Skat player! The following holds true even when playing Skat free of charge: no one is born a tournament master! Besides studying the rules, it is vital to gain experience by playing so that you can improve with each round. What also works is asking seasoned players for advice. This could take your game to the next level, even when facing real opponents! Experience the world of GameTwist: start your game! Card games and others: There are countless skill games on GameTwist besides Skat that will test your prowess in particular ways. Apart from outright classics such as Pool, Chess and Spider Solitaire, you can play genuine gaming hits like Yatzy Live, Belote and Jewel Magic and stake everything on one card! Simply put, you are spoilt for choice whether you play on your PC, iPhone or iPad, tablet, or Android mobile!